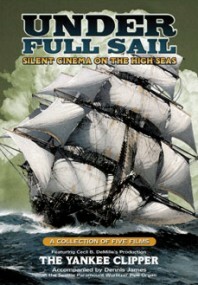 The latest DVD offering from the creative and painstaking people at Flicker Alley is a rather surprising package, Under Full Sail. Following on from the imaginative packaging of silent film on the immigrant experience as Perils of the New Land, this latest offering brings together a selection of silent films on the theme of sailing ships. The centrepiece is The Yankee Clipper (1927), directed by Rupert Julian and produced by Cecil B. De Mille, a drama of the China tea trade, filmed aboard an 1856 wooden square-rigger, starring William Boyd, Elinor Fair and Frank ‘Junior’ Coghlan. The additional titles are Around the Horn in a Square Rigger (1933), Alan Villiers’ account of the voyage of the barque Parma from Australia to England in the 1933 Grain Race; The Square Rigger (1932), a sound short showing life aboard the schoolship Dar Pomorza; Ship Ahoy (1928), a record of a schooner employed in the North American lumber trade; and a ten-minute sequence from Down to the Sea in Ships (1922), which records a whale hunt on board the 1878 wooden ship Wanderer out of New Bedford, Massachusetts. All of which looks like an interesting attempt to beef up The Yankee Clipper, which is not that well-known a title, with films which would otherwise have been unlikely to find their way onto DVD, producing a package that ought to reach beyond silent film specialists to a wider market intersted in sailing history. Films don’t just tell stories, they tell histories, so let’s hope the release is a success and that Flicker Alley can provide us with more such socio-historically informed DVDs. For the silent film music buffs, the release is also notable for being (surprisingly) the solo DVD premiere of renowned organist Dennis James, who accompanies The Yankee Clipper on an original-installation 1928 Wurlitzer pipe organ, recorded at Seattle’s Paramount Theatre. I’ve never seen The Yankee Clipper, so looking forward to it myself. It’s an unusual package, and it’ll be interesting to see if Flicker Alley reach new markets, or simply puzzle film buffs who don’t know of any film called Under Full Sail.